John Podesta will be leaving the Center for American Progress to join the Obama administration as a special advisor, which could be potentially great news for FOIA and transparency advocates. 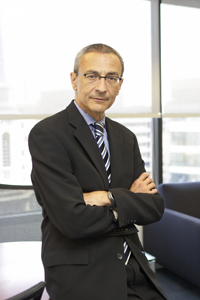 To list just a few of his FOIA bona-fides: Podesta was behind many of the Clinton administration’s important declassification decisions when he was Chief of Staff; he’s called for the declassification of all documents on aliens; he played a role in E.O. 12958 that requires the declassification of most government documents over 25 years old; he’s repeatedly given pro-FOIA testimony; and he spearheaded discussions that played a role in the creation of FOIAonline. Hopefully part of Mr. Podesta’s portfolio will be filling Norm Eisen’s role as FOIA and transparency watchdog and compelling agencies to adhere to the administration’s FOIA demands. With hard work, fulfilling its early pledge to make government transformatively more open (including actual FOIA and declassification reform) and being “the most transparent administration in history” is an achievable second-term goal for the Obama administration. Hopefully Mr. Podesta is ready and willing to put in the elbow grease to make it a reality. In other news this week, at a Senate Judiciary hearing yesterday National Security Agency (NSA) head Gen. Keith Alexander stated there would be no other way to “connect the dots” if the NSA’s bulk data collection program was terminated. Alexander implied that were the program scrapped, the U.S. would revert to a “pre-9/11 moment,” leaving the country and its intelligence agencies vulnerable to a terrorist attack. Judiciary Committee Chairman Patrick J. Leahy (D-Vt.) expressed considerable skepticism, saying that the program was “uniquely valuable” in only one terrorism case. Back in Congress, the nomination of John Carlin to run the Justice Department’s National Security Division, a senior post that aids in authorizing secret surveillance operations and managing national security investigations, is coming under intense scrutiny. According to a recent Foreign Policy article Carlin “has requested that colleagues not copy him on emails about sensitive policy issues” and that many of his conversations take place on the phone, making his communications nearly impossible to FOIA. The article also notes that Attorney General Eric Holder did not support Carlin’s nomination, rather that his position was secured by select White House support. The Egyptian cleric captured during the CIA’s extraordinary rendition program in 2003 was convicted on a decade-old terror charge in Milan this week. As previously reported, an August report argued that the threat Osama Moustafa Hassan Nasr posed was exaggerated to justify both his 2003 kidnapping in Italy and to justify Bush’s extraordinary rendition program. Nasr was sentenced to six years in prison. Be sure to read the Rolling Stone profile of Edward Snowden and Glenn Greenwald, written by Janet Reitman –who wrote the much discussed profile of Dzhokhar Tsarnaev –with quotes on the operations of the National Security Agency from Archive fellow Matthew Aid. Finally this week, the National Security Archive just made its oral arguments before the United States Court of Appeals for the District of Columbia Circuit in our case against the CIA to release the fifth and final volume of an internal CIA history of the Bay of Pigs invasion. The Archive’s FOIA lawsuit has already won the release of three volumes (a fourth was released by the JFK assassination review board). The CIA (supported by the Department of Justice) had argued that volume five (but for some reason not the other volumes) must be withheld under the b(5) deliberative process exemption, because its release could “confuse the public.” We will keep you posted on the case’s progression.